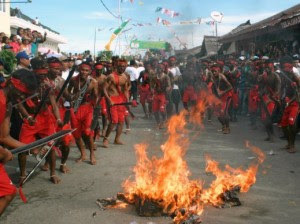 One of the events and traditions that still continue to be held is AT broom stick, carried by the King together with the Foreign Affairs and Mamala Morella in Ambon - Maluku, where the event is held on every 7 (seven) days after the Day of the Great Islamic "Eid", where the hallmark event that Sweep at Lidi Aren ketubuh between opposite each other, subject to conditions and may not be on the face or parts pital opponent. Events AT broom tradition has been going on since a few hundred years lahu in Morella and Foreign Affairs Mamala, so that almost all the people around the island of Ambon and foreign travelers who know the show is definitely solid tardisi attend and witness the event the broom AT tradition, as well as BAMBOO tradition iNSANE events are very well known by the people of Maluku and other parts of the community where the event GILA BAMBOO tradition is known is derived from the Moluccas, but there are many other areas of society that does not know what the event is called BAMBOO iNSANE, and many more events tradition Maluku who have not and are not known by the State - the State and the other in the Maluku people from other parts of the archipelago - Indonesia. · Dance Dance Cakalele depicting war. 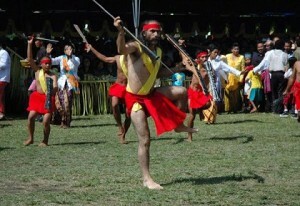 This dance is usually performed by the men holding the machete and Salawaku (Shield). · Saureka-Maker using sago palm midrib. Dance performed by six girls in desperate need of accuracy and speed while accompanied by the rhythm of the music is very interesting. · Katreji, played in pairs between women and men with varied movements are energetic and exciting. This dance is almost the same as the European dance in general because Katreji also an acculturation of European culture (Portuguese and Dutch) with culturally Maluku. It is more apparent on every cue in the floor and the changing patterns of motion that are still in Portuguese and Dutch as a process biligualisme. The dance is accompanied by musical instruments violin, bamboo flute, ukulele, Karakas, guitar, drums and bass guitar, with a pattern of western music rithm (Europe) are more prominent. 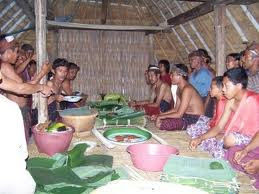 The dance is still alive and loved by the people of Maluku until now. · Polonaise, which is usually done at the time of marriage Moluccan by every member of the party in pairs, forming a circle formation and perform minor movements can be followed by anyone both young and old. · Bamboo Dance Crazy. Crazy bamboo dance is a special dance that is magical, from the village of Suli. The uniqueness of this dance is the dancers seemed to be burdened by the bamboo dance moves uncontrolled and can be followed by anyone.